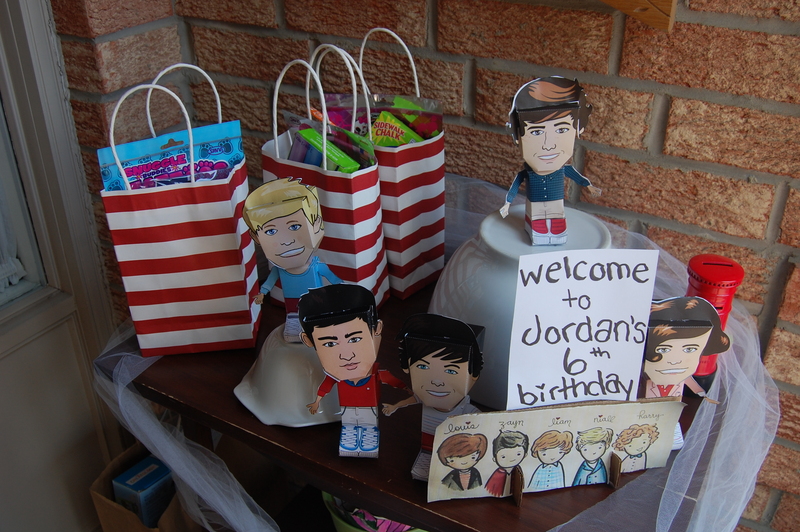 Last weekend we celebrated Jordan’s sixth birthday! We let her pick the theme and she chose One Direction. So armed with that knowledge and one week I tried to pull together as many 1D elements as possible for our backyard pool party. 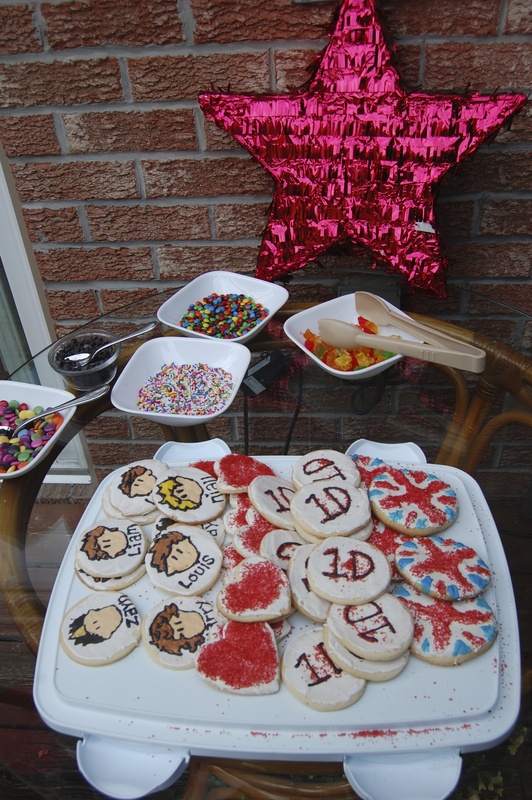 You would think that One Direction decorations would be really popular in stores right now (given they seem to be the number one choice for six year old girls these days) but actually we had a really tough time finding pre-done party ideas. So we had to get creative. The party was on Sunday and I had the misfortune to be at work all day Saturday. 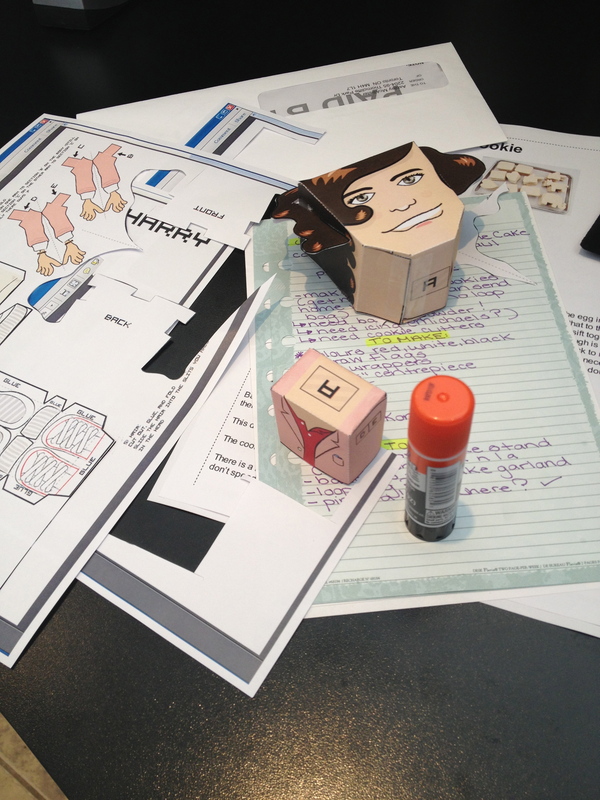 I found these great little DIY One Direction paper doll patterns online and spent the day (in between answering the phone, obvs) making these little guys. I had no idea what I was going to use them for but at this point (the DAY BEFORE) I had nothing with any of the 1D faces or anything! I had struck out at every party store in the city. What is an amateur party planner to do? I figured that a bunch of kids would love nothing more than a dessert bar so I figured I would start there. Of course this was problematic because unlike every other kid Jordan hates chocolate, so that meant everything had to be vanilla or candy. I decided for a make-your-own sundae bar and sugar cookies, in addition to a candy-stuffed piñata and a custom vanilla cake. 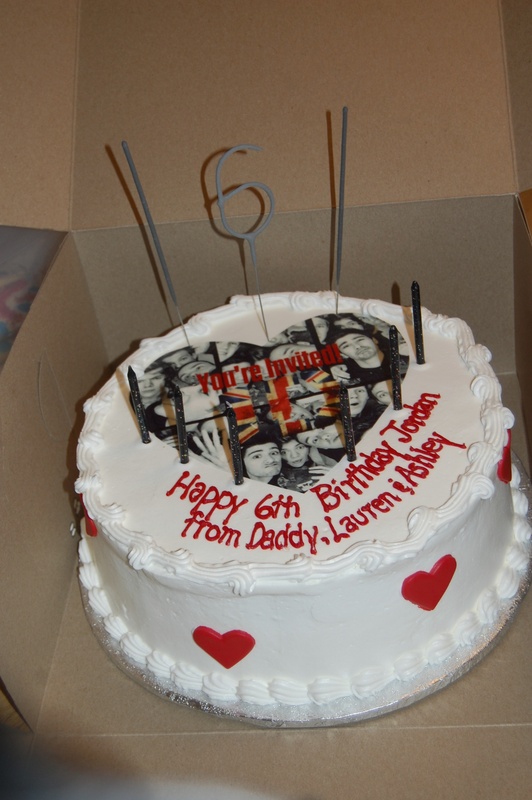 I knew I couldn’t handle a One Direction cake but since the best bakery quote I could get for cookies was $80 for two dozen (the custom bakery cake was only $55!) I decided it was time to work my DIY skills. I found this recipe for sugar cookies (I used the royal icing recipe on that site too, and bought a few different icing dyes from a local party store to individually dye each colour for the icing. It was a way bigger process than I thought but it was definitely worth it!) 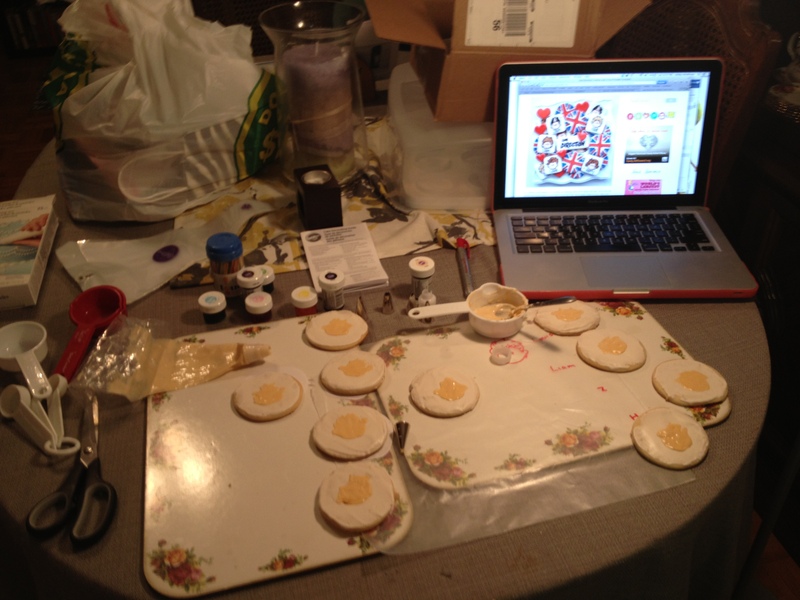 and stayed up until 1am decorating the cookies. 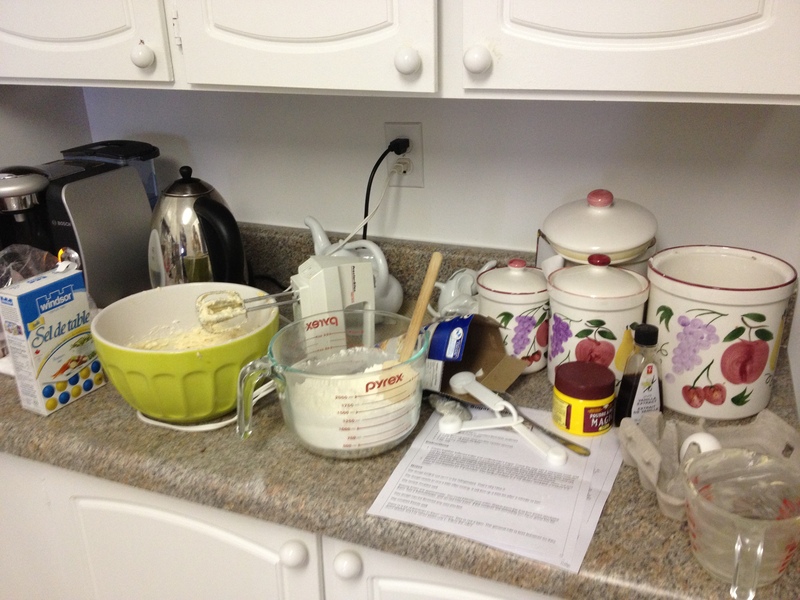 My novice baking skills as evidenced by how I used measuring cups to mix icing instead of actual mixing bowls. Screw technique, it’s all about results, right? I also trashed our kitchen. Justin picked up the cake Saturday night and we hit up Bulk Barn for sundae treats as well as ingredients for the sugar cookies and I have to say it was a major success. We spent about $30 and got a ton of goodies. I really feel like we would have spent a lot more than that if we’d just gone to the grocery store, not to mention the stress of finding meringue powder at Loblaws. Not a fun time I imagine. I would say from this experience I learned a) if I ever make sugar cookies again I will buy a cake mixer because not only was my poor little hand mixer making some seriously concerning noises but also there was this clear smell of overheating motor that I will likely pay for later but also b) my hand hurt for days. Not just mixing but I had to hand pipe every detail of the cookies because I couldn’t find a way to just project their faces like the Internet suggested. The Internet clearly lies. After an exhausting cookie night we woke up pretty late Sunday and had to break world records for loading stuff into the car. And our tardiness meant I spent the half hour car ride blowing up 30 balloons. Then we precariously managed to get them into the house where I sewed them together into a garland using fishing line. 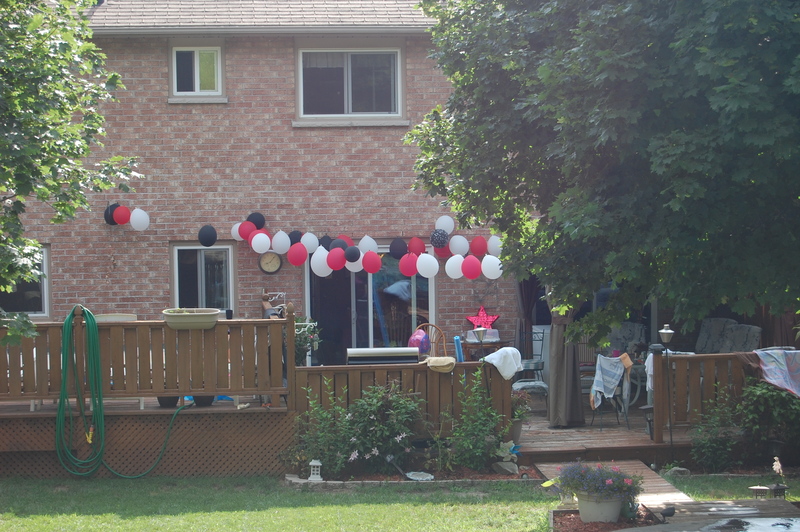 We strung up the garlands across the deck for a fun look! I didn’t think to take a picture until after the party and the sun had done some damage to the balloons by late afternoon (turns out the sun WILL pop your latex balloons) but you get the picture! All in all though it was a fun day and Jordan had a blast so really that’s all that matters! 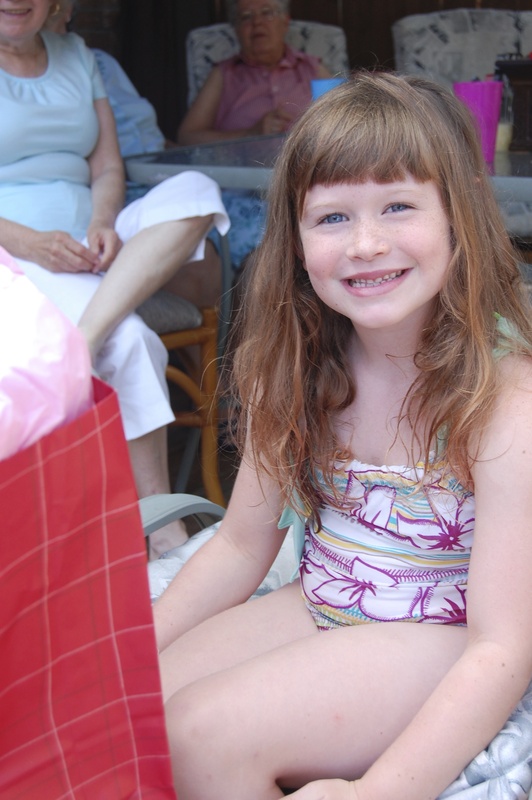 Oh and P.S. 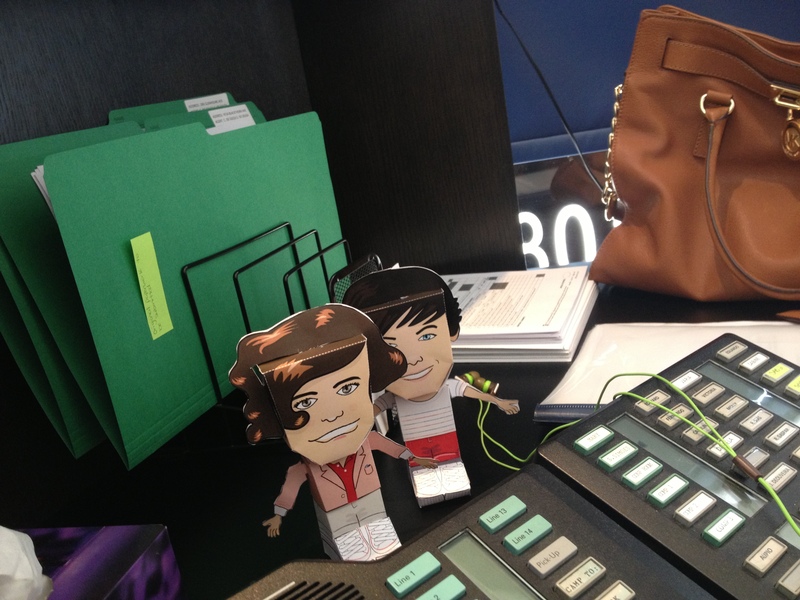 – I managed to find the little paper dolls a home by setting up a little display with the loop bags at the front door. It was easy and they looked adorable.